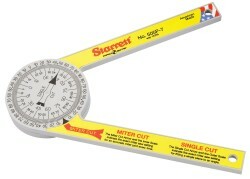 Who remembers using a protractor at school? Mathematics and Physics classes used these, but what has that to do with a mitre saw you may well ask? For those that don’t remember they were the semi-circle thing inside your pencil case, that measured angles. It also measured these to a very high degree of accuracy. Well it was the only time I ever used that strange looking thing. That is what a mitre saw protractor will do for you. Some people just don’t own a mitre saw, but they do own a handy circular one. They can then use a form of protractor to set the angle for the cut, and then use the circular saw to make the actual cut. You can of course also use an ordinary hand saw to make this cut. 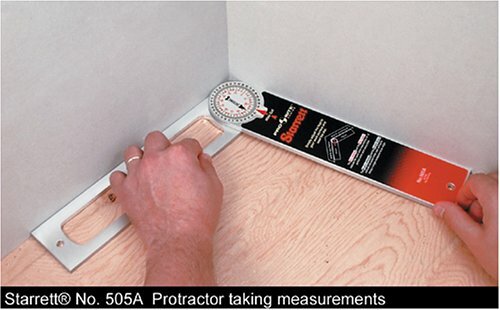 You will find a protractor like the one in the picture below still being used by tradesmen such as joiners, carpenters, plumbers and builders. In the main though this would be used to measure angles, and then use that angle to set your mitre saw to the perfect angled cut. As a little side note, these are also useful for making sure the fence is square on your mitre saw. Why Use One of These? They can kill two birds with one stone is why this tool is so useful. We all probably know that where two walls meet in our house, that the angle is around 90 degrees, as shown in the image above. I have worked on houses for years and I can assure you that it is very rare you will find the perfect 90 degree angle. 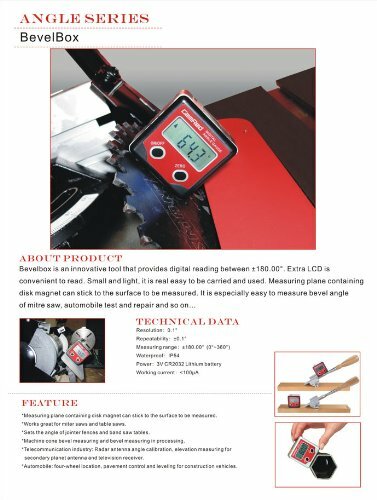 This tool will read this angle to perfection and also does the calculations for the mitre saw setting, and that makes it very useful, especially for perfectionists. So as you can see from the video above, the use of this tool guarantees an extremely accurate joint. You may well think a couple of degrees won’t make a big difference, but the reality is that it does. This is especially true if you are working with longer pieces of timber. For those that take immense pride in their work, this is a great way of ensuring high degrees of ultimate accuracy. I use the Starrett myself as I like the quality a lot and it is accurate and simple to use. I have shown this product just down below and the average price for something like this is £20. So far I have been discussing the manual version and these are useful as long as you take good care of them. Normally you can buy a cover for these, and for the extra couple of quid, I think it is worth doing that. I like this one from Starrett as it is easy to read and the yellow colour makes it easy to find. Many floorers will use this type of product, and it can be a handy addition to any too kit. There are also digital versions of these,and they offer a good alternative. Typically these will be in a combination style tool and usually comes with a spirit level. I have shown a picture below. This type of protractor usually comes with a nice pouch, will include an LED light and have a magnetic surface that allows it to stick to the walls, where possible. These do get great reviews and as such I bought one of these and checked it out. I like it and it works really well. If you plan on cutting bevels using your compound mitre, then this digital version will truly come into its own. You can also use this with band saws and table saws, and it is great if you plan on doing a lot of work involving a range of bevel cuts. I have also use this with my lathe and found it very good. For the person who simply does a little bit of DIY, you can skip this one out, as in my opinion you will probably never need it. I also found with this that it really only works on the verticals and can not really be used on the horizontal planes. If you do a lot of work in loft conversion, then get this one for your tool bag and you will not regret that decision.